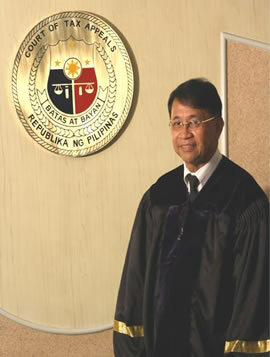 Associate Justice Caesar A. Casanova, a native of Pulilan, Bulacan, was born to Dr. Francisco R. Casanova and Dra. Felicidad D. Aguirre on September 9, 1948. He has six brothers and three sisters, namely (in order of birth): Francisco, Jr., a Doctor of Medicine; Manuel, a Doctor of Medicine; Virgilio, a Civil Engineer; Zenaida, a Doctor of Medicine; Renato, a Commerce graduate and law student before migrating to the U.S.A.; Concepcion, a Registered Nurse; Efren, a Doctor of Medicine; Robert (adopted), a Computer Engineer; and Susan (adopted), a Registered Nurse. He is married to Amelia G. Eusebio, who also hails from Pulilan, and the couple has three children: the eldest is Caesar, Jr., a Doctor of Medicine; followed by Caesar III, a Mechanical Engineer, and Marie Celine, a Lawyer. Justice Casanova finished his elementary education at the Pulilan Elementary School in 1961, his high school at Letran College in 1965, and both his Bachelor of Science in Commerce (major in Accounting) in 1969 and his Bachelor of Laws in 1975 from the University of Sto. Tomas.This qualified him to be a CPA-Lawyer. Right after passing the Bar, he was employed as Trial Attorney at the Citizen's Legal Assistance Office (now PAO) of the Department of Justice in Padre Faura St., Manila. In 1982 he resigned and practiced law privately; then in 1990 he was appointed Assistant Prosecutor of Manila. After more than four years of being a Public Prosecutor, he was promoted as Judge of the Regional Trial Court in Malolos, Bulacan, on January 23, 1995. On October 29, 2004, he was appointed as Associate Justice of the Court of Tax Appeals. Justice Casanova authored a book entitled "Cross Examination Mirror" wherein he is recognized as the first Filipino to ever single out and write a book about Cross Examination alone.